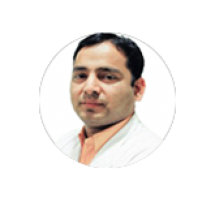 Dr. Bisht has immense experience as a Radiation Oncologist in treating all types of Cancer patients in leading centers in Gurgaon. As a Professor of Medical Oncology, he has been expertise in Head Neck Oncology and High Precision External Beam Radiotherapy. He had done his CyberKnife Training from International Faculty in 2012. He has over 13 years of experience of satisfied patients in his field. Dr. Shyam from the division of radiation oncology has a 1-year Fellowship in High Precision EBRT from Medanta Cancer Institute. He was awarded GC Pant Young Doctor Award and Fellowship in 2010 for best paper presentation award at National Conference, Gold Medal and Trophy in 2008 for best paper presentation award at AROI-2008, SGPGI and a Silver Medal-AROI 2005 for Best Paper Session. He also holds membership certifications of AROI- National, AROI- UP Chapter and Indian Brachytherapy Society.